I have been taking myself (and my Midori Traveler’s Notebook) on lots of artist dates lately. 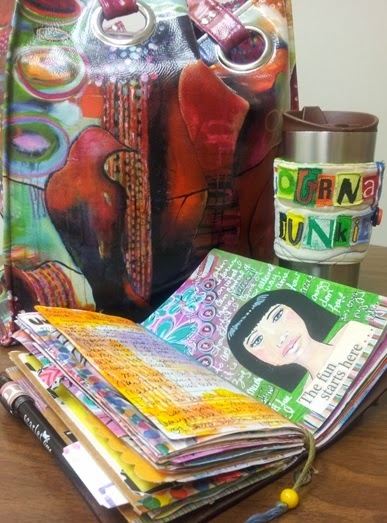 It fits perfectly in my Flora Bowley tote (and looks adorable with my coffee cozy, doesn’t it?). I also visited a couple of the smaller museums and art gallery spaces, including the Center for Contemporary Art. Always quirky and sometimes downright bizarre! I was excited to hear that they are expanding and will be moving to a larger space in town in the near future. Yeah! More quirky and more bizarre art to look at! 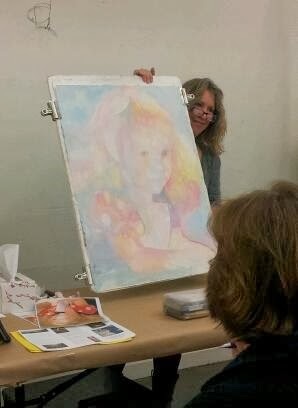 Saturday afternoon, I pushed myself outside my comfort zone and attended a watercolor demo by artist Jeannie Vodden at University Art in midtown. I have played with watercolors in the past, but usually just as splashes of color as a background for an art journal page and more recently to make quick little faces in my Midori (I love the little tubes of watercolors, water brushes, and a spray bottle as part of my on-the-go art journal supplies). 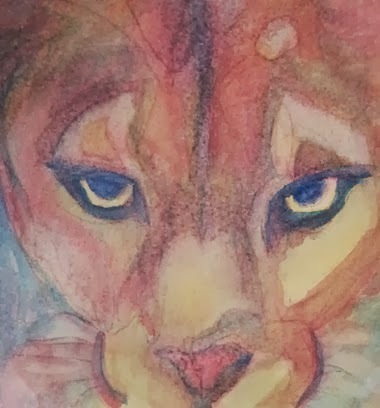 Her watercolor techniques opened my eyes and inspired me to really get to know this medium and figure out how to adapt it to work with my style. Tip: I’ve learned from other classes/demos that I’ve attended that it is important to get there a little early. Ensures you get a good seat and allows you to avoid the really long lines after the class/demo. Also, everyone is trying to buy the same things and the store rarely has enough for everyone. So now when I plan to take a class/demo, I check out the artist’s website first and figure out what their favorite materials are. Jeannie already had some of her favorite materials posted on her website. She also handed out a material list at the beginning of the demo. I was able to buy the minimum amount of supplies I really wanted before the class started and walked right out the door while everyone else was trapped in the watercolor section. Saturday night I tried my hand at Jeannie’s method. Whoa! I was really excited with what I was able to accomplish in such a short amount of time and with only 3 watercolors. It’s obvious that to go much further I’ll likely need to take some watercolor classes (especially one of Jeannie’s) so I can fully understand how she gets those final layers in there. But even with the little bit that I already understand, I am excited! What sort of artist dates have you taken yourself on lately? What medium is totally outside your comfort zone? I dare you to give it a go. It's a great idea to check out the website and arrive early to buy things. I enjoy going on short jaunts to museums here in NYC. After an hour or so I find myself on visual overload, so I can't take more than that but oh, what inspiration I find in museum images! Abstract modern art is way out of my comfort zone. I don't understand it, can't interpret it or understand what others see in it. However, I'm a member of MOMA and I do keep trying. Teri, I got to see the MOMA gift shop once. I was hosting an exhibit booth for Destination Imagination and ran there at the end of the day only to find out they were about to close. I sweet talked them into at least letting me go inside the gift shop. I soaked up every bit of inspiration I could in that 20 minutes. I will be back MOMA. I. Will. Be. Back.